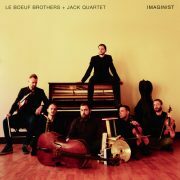 The Le Boeuf Brothers’ fourth album, Imaginist, due out on Oct. 14 via New Focus Recordings/Panoramic Recordings, is an interpretation of the works of twin brothers pianist Pascal Le Boeuf and saxophonist Remy Le Boeuf in collaboration with New York-based JACK Quartet, featuring Grammy-nominated tenor saxophonist Ben Wendel, alternating bassists Ben Street and Martin Nevin, and alternating drummers Justin Brown and Peter Kronreif. Based on the 20th-century Russian poetry movement and structured to unfold like a book, Imaginist presents “an amalgamation of fresh improvisatory approaches with an informed compositional aesthetic branching from literature, jazz, and the ‘new music’ community,” according to the Le Boeuf Brothers’ website. JazzTimes is proud to premiere “Alkaline,” a cut off the new full-length album.